When you're dorm room shopping and making your dorm essentials list of dorm items you need to take to college, you don't want to forget college shelf liners. You want to start college strong and that means thinking of every dorm necessity you could possibly need in order to make yourself more comfortable and your dorm room feel like a home away from home. Of course, you also need to think of protecting your college supplies and not just for dorm security. You also need to protect your dorm essentials from stains and damage. And while your university provided dorm items are not your own, you need to treat and protect them like your own because the last thing you want to do at the end of the school year is end the year with costly damage fees. You may think it is hard to protect some of those university provided dorm items such as your dorm dresser and college desk. 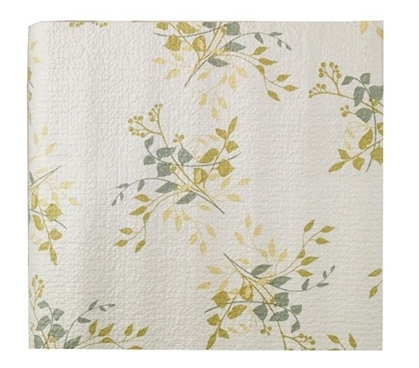 However, it is cheap and easy to protect those dorm items with our Grip Print Shelf Liner in Aspen Aloe! Dorm shelf liners aren't just for the insides of your dorm essentials, especially when they have such pretty patterns as our Aspen Aloe design with green and soft blue-gray leaves on a white backdrop. While you are covering the insides of your drawers and the tops of your dorm closet shelves, cover the tops of your dorm dresser and college desk, too! Our Grip Print Shelf Liner in Aspen Aloe is non-adhesive and it is stain resistant so you won't have to worry about water rings and scratches acquiring on your dorm dresser and desk. Protect your dorm essentials with a cheap option that also adds to your dorm room decor with our Grip Print Shelf Liner in Aspen Aloe!